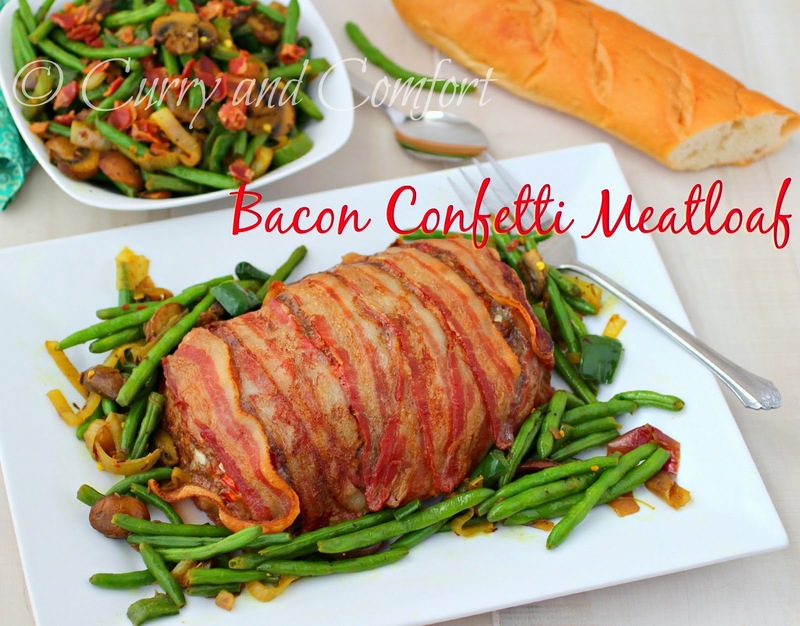 A few days ago I shared my recipe for Green Beans with Bacon and Mushrooms. 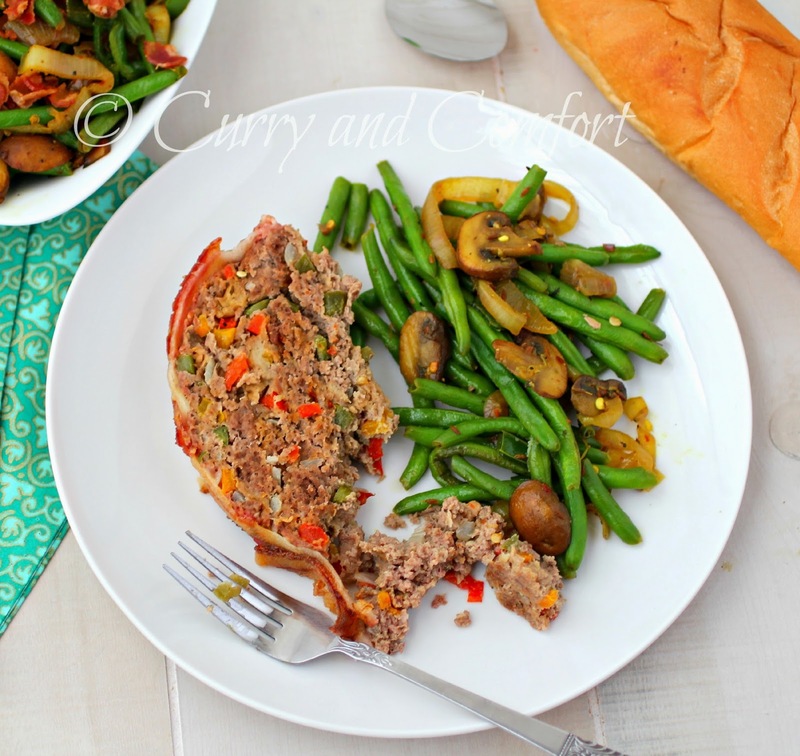 I made those delicious green beans to go with this Bacon Confetti Meatloaf that am so excited to share with you today. The idea of making this meatloaf came to me because I just happened to have a lot of different colors of bell peppers in my fridge. 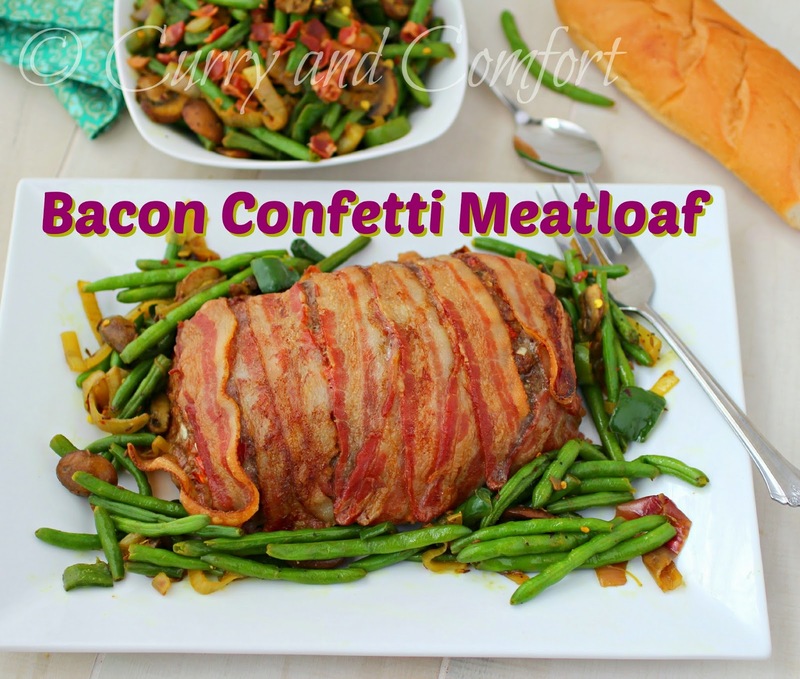 I knew they would look like colorful confetti in the meatloaf and we all love a good meatloaf around my house. 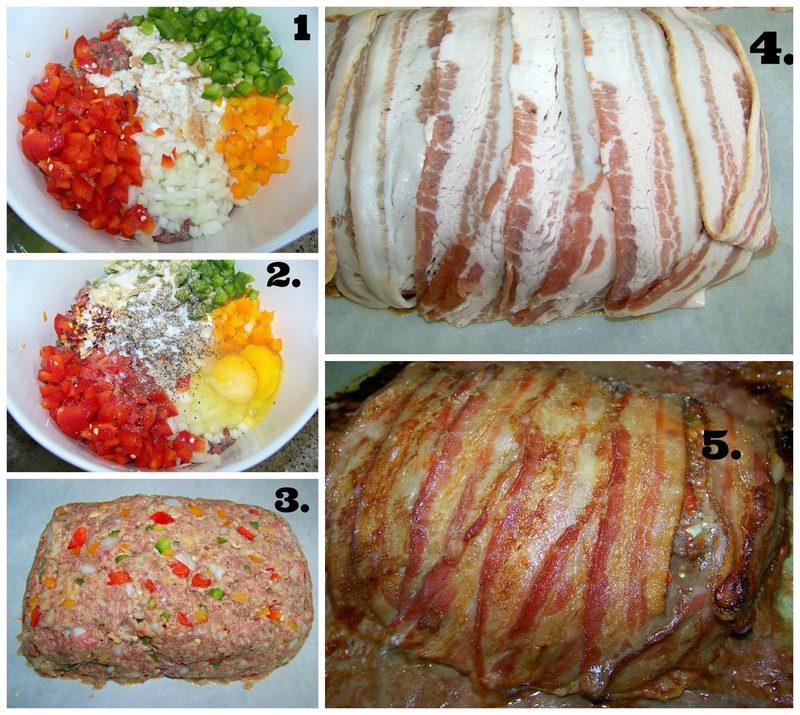 Once the confetti part was done, I decided to take this meatloaf over the top by draping some bacon around it. Can I tell you how great the house smelled while this was baking in the oven? I could not wait to take my photos to dig into both these dishes. My husband came to the lunch table and I think his eyes fell out of his head when he saw this beautiful meatloaf sitting there. The kids even enjoyed it (although my son was not so happy about all the pepper confetti... he is not a bell pepper fan. I'm working on that... how can you not like peppers? This was a very "bacon-licious" meal for us since we indulged with bacon in both dishes. Hey, we don't get to eat like this every day, but once in while is just fine. 2. Add soaked bread, peppers, onion, eggs, seasoning, sriracha sauce (or ketchup) to lean ground meat of choice and mix well. 4. Take each slice of bacon and drape across loaf. If it's too long, bend it back over and across. Try to cover the meatloaf completely. 5. Bake in the middle of oven at 375 degree oven for 1 hour. Then increase the heat to 425 degrees and bake for another 10 minutes to get the bacon crispy. Allow loaf to sit for 10 minutes before slicing. What a terrific meatloaf! I always wrap mine in bacon, too---so yummy! 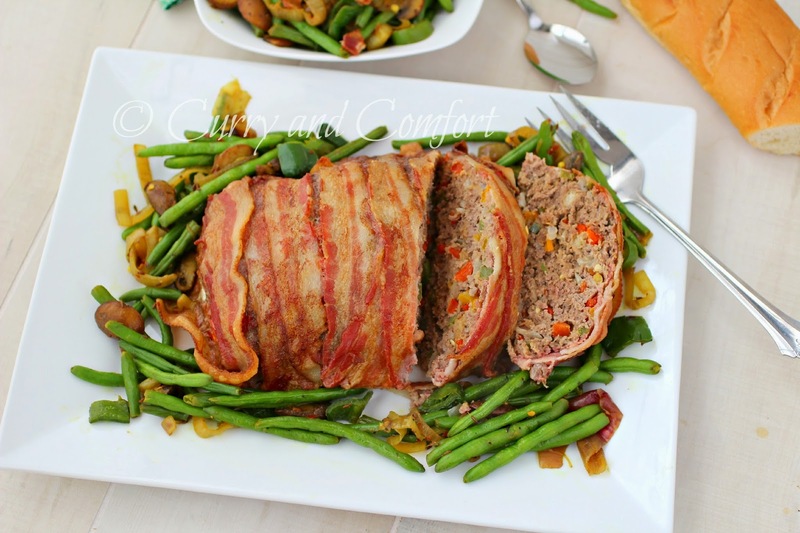 I've wrapped my meatloaf in bacon before and it was great. Definitely not something I'd do regularly but it was a wonderful change of pace. Made this tonight for dinner, easy and is looking good!...Will be eating soon...Yummy!!! !